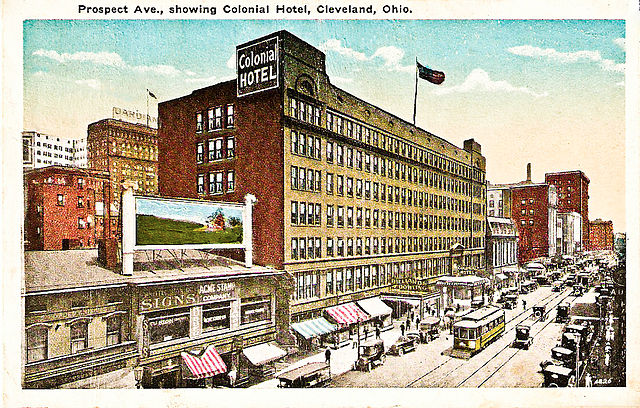 The first meeting of the Cleveland Soccer Football Club took place at the Colonial Hotel, which is known mainly because it was one of the first indoor shopping malls in the country. Licensed under Public Domain via Wikimedia Commons. Cleveland has a very long but under-recognized soccer history. The first official game took place in 1889, the first league formed in 1906, and the first fenced soccer-specific field was built in 1914. Cleveland teams have contested the US Open Cup title three times, in 1930, 1945, and 1973, and the Shamrocks won the Amateur Cup in 1932. The history of soccer in Northeast Ohio is longer and stronger than most people imagine, as this second of two timelines of soccer’s beginnings in Cleveland illustrates. Craig Tower, aka @TheSockerite, is a cultural anthropologist and recovering academic who began researching 1960s and 1970s US Open Cup history for theCup.us. His main areas of soccer history interest are Cleveland, where he grew up, and Maryland, where he currently lives. His work has appeared on theCup.us and his blog TheSockerite.blogspot.com.